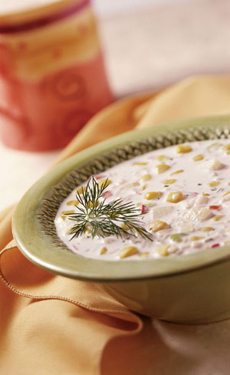 Corn chowder. What defines a chowder? See the definition. Photo courtesy Frontier Soups, a NIBBLE Top Pick Of The Week. CAPSULE REPORT: Every culture makes soup: It’s easy, filling and nutritious. Understand the differences between the soups you enjoy regularly—broth, chowder, consomme, purée and many others. This is Page 1 of a six-page article. Click on the black links below to visit other pages. In many parts of the world, soup is a nourishing breakfast. For much of America’s history, many households served a soup course for dinner. Soup and sandwich remains a favorite American lunch. There’s even dessert soup. 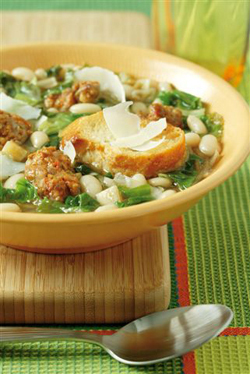 When serving soup as part of a larger meal, the soup should complement the rest of the meal. A light soup complements a heavy main course (steaks, chops, stew); a heavier soup goes well with a lighter main course (pasta or grilled fish, for example). Homo sapiens, modern humans, emerged about 200,000 years ago. (1) For the majority of our existence, we have had no soup. Our word soup comes from French soupe, which derived from Vulgar Latin suppa, from the post-classical Latin verb suppare, to soak. This indicated bread soaked in broth, or a liquid poured onto a piece of bread. In Germanic languages, the word sop referred to a piece of bread used to soak up soup or a thick stew. The word entered the English language in the seventeenth century exactly as that: soup pored over “sops” of bread or toast (which evolved into croutons). Prior to then, soups were called broth or pottage. The bread or toast served as an alternative to using a spoon. Today’s soup croutons evolved from sops—pieces of bread soaked with soup. While the rich enjoyed elaborate soups, basic soup was a poor man’s dinner. Until recent times, the evening meal was the lighter of the two meals of the day; a soup or sop would be a typical evening dish. The name of the meal evolved to souper, than supper. Since it’s a liquid, why do we “eat” soup rather than “drink” soup? Because it’s served in a dish. If you consume it from a mug or cup, then you can be deemed to be drinking your soup. (3) An A-Z of Food and Drink, John Ayto: Oxford University Press (2002), p.316; and Early French Cookery, D. Eleanor Scully & Terence Scully: University of Michigan Press (1995), p.102.